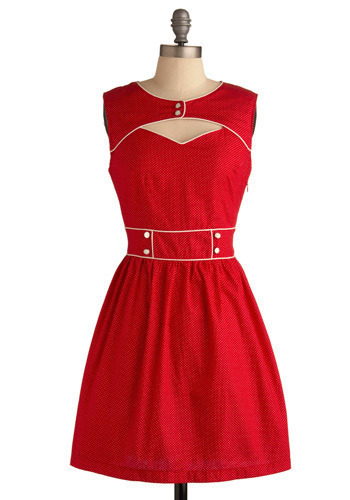 Red-y and Rarin' to Go Dress: $70. 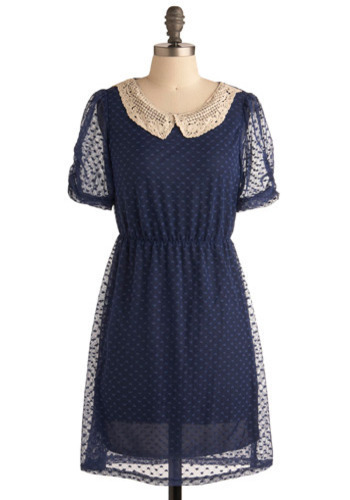 So on my Christmas list I decided to put a few dream splurge items from none other than the lust worthy Modcloth. Hey, a girl can dream can't she? These two dresses really captivated me, and they're not too ridiculously out of my family's Christmas gift budget. I love the neckline and adorable details of the red dress. It would look perfect with a little boater hat and sandals in the summer! (and a cardigan and thick tights in the winter...he) And of course the lace peter pan collar was the highlight of the Social Graces dress for me. Also, you can't tell, but what looks like little polka dots on the dress are actually little hearts. Swoon! Hope you all had a truly lovely weekend! We are in the middle of a huge snow storm right now, so I'm crossing my fingers and dancing in front of the refrigerator tonight for a snow day tomorrow! Labels: Catching My Eye., Holidays., winter, Wish Lists. These are so pretty, that red one would look amazing! That first one is so cute!! Love it! !